Every Friday of each month, come enjoy snacks, share good company, and take your relationship to the next level. 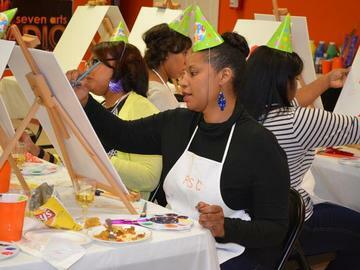 Couples or friends come together to enjoy a night of fun painting and “getting-to-know-you” game (see calendar for specific day and time) to complete the bond. We also do not discriminate between couples so bring a friend, spouse or any significant other. POLICY REMINDER: We will accept late arrivals up to 30 minutes after start time. There are no refunds or credits for late clients, cancellations less than 24 hours or no shows. The artist is allowed to leave after 30 minutes if no one shows up for their reservation. Note: A courtesy call to our studio will assure you are committed to your reservation. If you’re not going to be able to use your reservation, call the studio and cancel. There are no refunds or credits for cancellations less than 24 hours or no shows. *NO CREDIT OR REIMBURSEMENTS FOR NO SHOWS – NO EXCEPTIONS! Must attend studio or party for services and supplies. **Please call to redeem vouchers accepted for specific days. Guests must be at least 21 years old to consume alcohol at the studio. No heavy liquors or guns in facility.